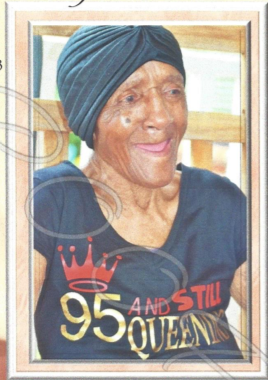 Mrs. Lureline Ware Whitlow, 95, of LaFayette died Sunday, January 27, 2019, at LaFayette Extended Care, LaFayette. Funeral  services will be held at St. John United Methodist Church, LaFayette on Saturday, February 2, 2019 at  1:00 p.m. (CST) with Rev. Terrance Holloway officiating. Interment will be in the New Canaan cemetery, Camp Hill. The remains will lie in state at the church from 12:00 p.m. (CST) until the funeral hour. Public viewing will be at Vines Funeral Home, Friday, February 1, 2019 from 12: 00 p.m. to 6:00 p.m. (CST). Mrs. Whitlow is survived by seven daughters: Ennice (Richard) Reese, Carrolton, GA, Betty Whitlow & Annie Ruth Whitlow both of Landover, MD, Ruby Whitlow, Doris (Clyde) Hardnett & Ernestine Whitlow all of LaFayette and Pearl (Clarence) Cobb, Valley; two sons: Henry Whitlow and Larry Whitlow both of LaFayette; one sister: Georgia Ann Stodghill, LaFayette; one brother: Lamb (Earnestine) Pearson, Dadeville; ninety-one grandchildren, forty-two great grandchildren; and a host of nieces, nephews, cousins, other relatives and friends.